Organize your property management business and start saving time and money today. Is a record maintained of funds deposited in your trust account? A general trust fund control record must be maintained of all trust funds placed in your trust account. These records must contain the information specified by the regulations in your jurisdiction. In addition to the general trust fund control records required by most regulations, you must keep separate trust account records for each beneficiary or transaction. 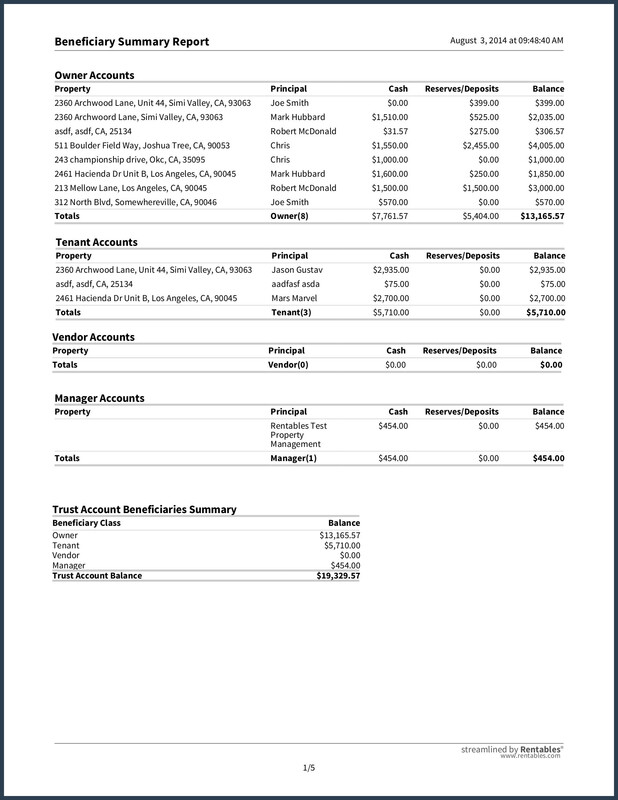 By adding the total of all these separate records, your total should equal the balance of your general trust fund control record. Are there unexplained overages in the trust account? Typically you must keep a separate record of these trust account overages and the funds must remain in a trust account and be reconciled on a monthly basis. Having all relevant information recorded properly and available should you need it is particularly important if you are required to maintain a trust account for your property management business. Using Rentables will help enable you to show exactly who every dollar in your trust account belongs to, how it got there and how it was used. Our property management software is designed to help you meet current regulations and makes it easy to record transactions and all the associated information typically required for compliance; however, our software is flexible and does not require you to record this information should you choose not to track it (not recommended). Other accounting software can do all of this but not without double or triple the data entry and all the errors that go with it. Rentables simultaneously maintains accounting views for all interested parties without you ever having to know anything about accounting or having to enter any information twice. When recording transactions, all transaction data is securely stored and maintained and you can easily retrieve the data when you need it. Avoid the hassle of pulling information from different sources every time you need to generate a report. With Rentables simply enter the information once and you're done. Property owners want an accounting of the profit and loss on their property and need to know what to put on their Schedule E required for preparing their taxes. 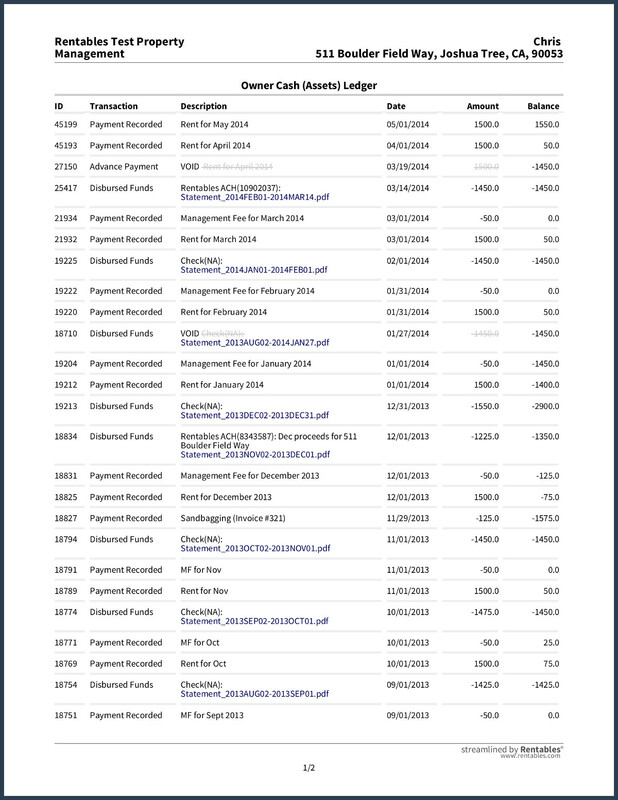 By recording all transactions in Rentables generating these reports is a breeze. Throughout the year you’ve probably made multiple payments to vendors for performing work on properties you manage. Can you easily break down vendor payments by property and by owner giving you the information you need to generate 1099s? Rentables saves you the time it takes to sort through systems and files to compile this information and conveniently exports all your data to an excel file for easy printing from your 1099 software. When a tenant moves out they may request a final accounting of their security deposit and in some states this needs to be provided to them within a certain timeframe. Stop scrambling to pull this information together for them. 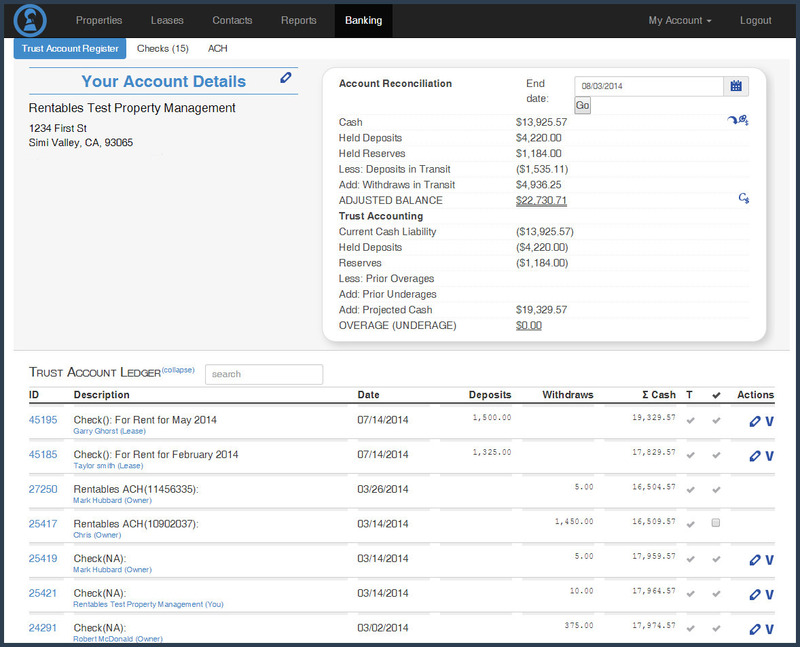 Rentables allows you to track the tenant’s security deposits and when you use this feature an full accounting of the tenants security deposit is just a few clicks away. Thousands of Americans die each year from home fires. The vast majority were in homes with no smoke detectors or with working detectors disabled. Most states require smoke alarms or combination smoke/carbon monoxide alarms in multi-family and single family rental units. Property owners are responsible for testing and maintaining the smoke alarms within all of the units in, or on, their properties. In the case of multi-unit buildings, landlords are generally responsible for testing and maintaining the devices in every unit, including vacant units. Rentables can help you keep track of this information and more. States may require that certain documents related to rental properties be retained for a period of time. When you store your documents in Rentables you gain peace of mind knowing that your documents are safe, secure, and easily accessibility from anywhere. Please refer to Rentables' Terms of Service for more information on secure data storage.